Matt Pearson has so many dreams, he has to be careful to order them, so he doesn't lose track. First, he wants to build a flying race car. Then, he wants to build another, and have them race against each other through the desert. This year. Then, he wants to launch a flying grand prix – in 2020. So far, he has succeeded in building a drone. “It’s objectively cool, right?,” he asks. Yes, I tell him. His terrifyingly dangerous drone is objectively cool. The Alauda Mark 1 Airspeeder looks like a sleek black cigar; it’s clearly designed as a homage to lightweight Formula One cars from the 1950s. The '50s were also the most lethal decade for F1 drivers. Its open cockpit and tiny frame are surrounded by eight huge uncovered counter-rotating props ready to tear into the air. 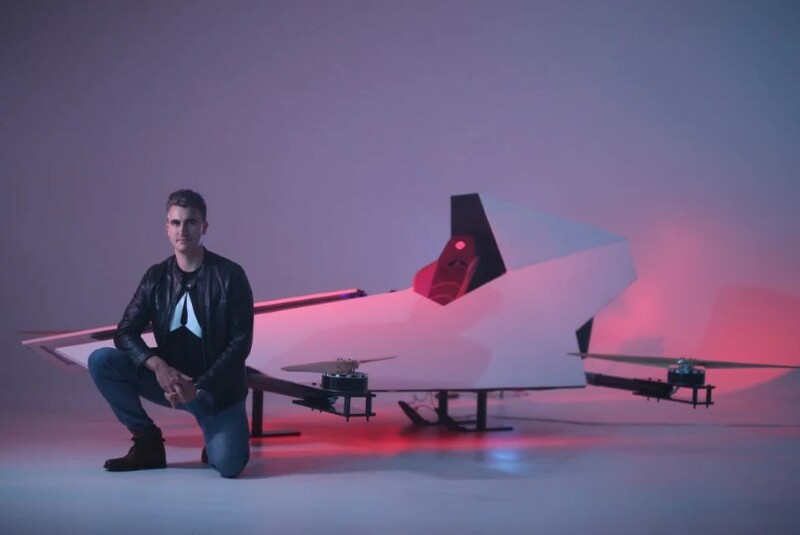 The Airspeeder is a labour of love for Mr Pearson, a successful Sydney-based entrepreneur who co-founded Honcho, a business-in-a-box service. That gave him the freedom to invest in several passion projects, including a space start-up and the restoration of a small timber yacht. When flying cars start racing, Mr Pearson says, the drivers are going to want to bump each other. Finding a way for them to do that without committing vehicular manslaughter looms as one of the key challenges. “There is no doubt that anyone who gets in one of these is a brave person,” says Mr Pearson. The version on display at the Australian Grand Prix this week is a three-quarter size prototype powered by eight lithium-ion battery packs. The team thinks those should be good for two or three laps (about 15 minutes of flight time) of a 10-kilometre track at full speed, after which they can be quickly switched out for fresh batteries at a pit stop. Full sized, it will weigh no more than 150 kilograms (including driver) and fly faster than 200km/h, according to Mr Pearson. By comparison, an F1 car weighs at least 728kg. The vehicle is being built by a team of eight young engineers, average age 22. They are supposed to have a full-sized prototype ready to race mid-year, with the first manned flight set for early next year. It’s an ambitious goal, particularly considering no one has driven one yet. Due in part to safety reasons, all tests have been done autonomously. But it’s not an impossible goal. In fact, flying cars are rather in vogue. Uber is making a flying car. Google co-founder Larry Page is testing autonomous electric taxis in New Zealand now. 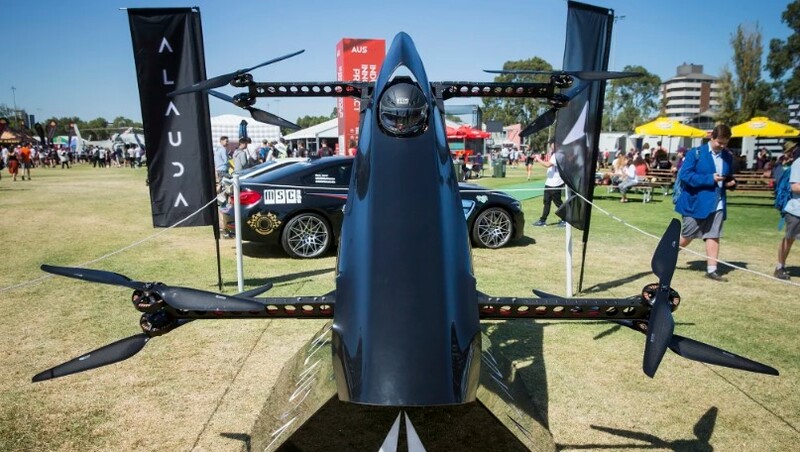 Advances in battery storage, energy efficiency and ultra-light materials have finally made the dream of flying cars feasable, experts told Fairfax Media. Matt Pearson, pictured here with an earlier prototype. It’s also hard to be too cynical about Mr Pearson’s plans given he’s funding the whole thing out of his own back pocket. The company cancelled a Kickstarter last year after falling $93,000 short of a $100,000 goal (Mr Pearson called the Kickstarter “an afterthought”). He’s modelling Alauda, the company building the Airspeeder, on Elon Musk’s Tesla. Mr Musk set the template for turning an innovative technology into a mainstream one: start by building something extremely desirable and extremely unobtainable (Tesla's Roadster), and then work downward to a model for regular consumers (the Model 3). Mr Pearson hopes to follow suit. “The essential, founding thing here: it’s not enough to create the vehicle, you have to create the race," he says. "That’s the key. We’re not trying to build a practical vehicle. We’re building an F1 car in the sky." Airspeeder TV Episode 9 is out!